GraphViz represents edge positions as B-splines. These are apparently a sequence quadratic Bezier curve segments, which can be drawn with a sliding window of length four coordinates and delta of one coordinate. The spline will therefore always have at least four coorindates. 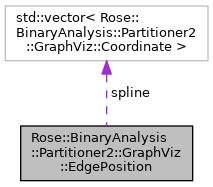 Since GraphViz identifies edges by their endpoints, there is no support for being able to resolve GraphViz edges back to their corresponding Sawyer edges when edges are parallel. Definition at line 873 of file GraphViz.h. Control points for the edge B-spline. Definition at line 874 of file GraphViz.h.